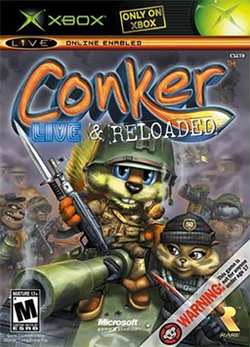 Conker: Live & Reloaded is an third-person shooter/platform/action game developed by Rare and exclusively released for the Xbox in June 2005. The single player mode is a remake of the 2001 Nintendo 64 game Conker's Bad Fur Day, but with new stages. It also includes a new multiplayer mode that is different from the Nintendo 64 version, which utilized Xbox Live. It is the final game in the Conker series. The game was originally titled Conker: Live and Uncut and featured a completely uncensored single player experience. At some point during the development of the game, this was changed and the game was released with heavy censorship. Even minor obscenities which were present in the original N64 version were censored. This drew criticism from fans of the original, especially as it detracted from comedic highlights such as the "Great Mighty Poo" song in the Sloprano chapter. This song was also censored on the soundtrack, and Rare once had the uncensored Xbox version of the song on their website. Like the original, the game was rated M by the ESRB and carried warnings about its content as well as Rare's promotional spoof warnings that advertised the fact that the content of the game was explicitly 'adult'. This page was last edited on 16 October 2015, at 19:22.